Truly palatial, this magnificent Wonga Park property needed an outdoor design that would complement the grandeur of this imposing home. In keeping with the opulence of the house, Exotic Pools and its parent company Ultracourts have created an outdoor space that makes the home look and feel like an exclusive 5-star resort. Exotic Pools, Ultracourts and the home builders utilised the steep incline at the rear of the property to incorporate four terraces, each with its own function. The slope was cut and filled to form the correct levels, accommodating the house, garden, gymnasium, pool and spa and tennis court. 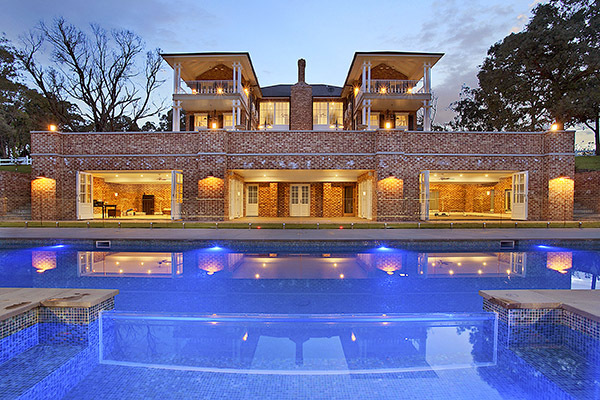 Spanning almost the entire width of the house, the enormous concrete pool measures 18m x 4m and features a 4m x 2m ledge. Accompanying the pool is a generous 4m x 2m spa, complete with eight multi-directional Venturi spa jets and a glass viewing wall separating the pool and spa. Both the pool and spa interior have been fully-tiled with glass tiles, highlighted at night by underwater LED niche lights. The pool features two skimmer boxes, a sand filter, a Pentair WhisperFlo pump and a water-levelling device. A ChemiGem D10 water management system keeps the water sanitised, while a Paramount PV3 in-floor cleaning and circulation system ensures the homeowners can spend their time enjoying the pool, instead of cleaning it. 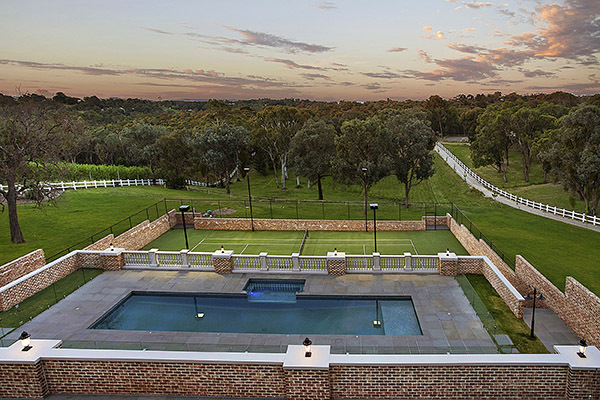 The tennis court at the fourth level also spans the entire width of the house, with access to specially-built covered seating and viewing areas under the swimming pool. With water-saving in mind, a 60,000-litre water tank was installed below the tennis court slab. The homeowners also requested two golf putting holes within the finished surface and an umpire’s chair to complete the picture. 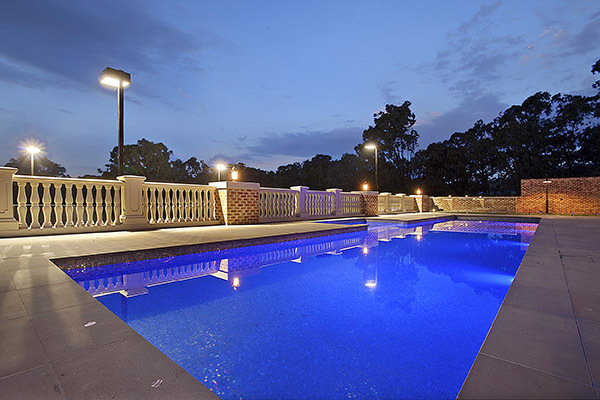 Established in 1995, Exotic Pools is a division of Ultracourts, and together the companies are able to offer a complete project package that often encompasses the construction of a swimming pool, a tennis court and the surrounding paving. A member of both the Master Builders Association of Victoria (MBAV) and the Swimming Pool and Spa Association (SPASA), Exotic Pools constructs individually-designed, high-quality indoor and outdoor inground concrete swimming pools and spas in accordance with SPASA guidelines. As well as designing pools, the company can also work with architects and designers to build pools and spas from existing plans. Committed to providing the highest standard of workmanship, all Exotic Pools projects are backed by warranties and after-sales service. The company’s aim is to design and construct swimming pools that are high-quality in both appearance and function, yet in keeping with its mantra of affordable elegance.